Whenever I receive a call from an individual or family that requests my services for a Celebration of Life, a large butterfly swoops right in front of me. It may happen while I am in my office looking out the window, in my car or out walking – anywhere! The first few times it happened, I thought it was special, but certainly did not expect it to keep happening. I just love birds! Watching birds, taking pictures of birds and I even have a small collection of ceramic birds. The other day I was writing a Celebration of Life Ceremony that was particularly challenging due to a shocking and sudden death. The intensity of the grief needed to be acknowledged while still trying to relate the positive, happy spirit of the deceased. Suddenly, my dog started going crazy and I heard loud squawking in the backyard. When I ran to find out what was going on, there were four huge black crows in the Hawthorn tree where usually there are only colorful little finches. I don’t know why death seems to be associated with crows or ravens, but that was where my mind went. Since I was a little kid, I have always been a Rock Hound. Whenever our family went on vacation we always had to make a stop at a Rock Shop so I could get a souvenir. Over the years I have collected all kinds of rocks and fossils. People like to give me rocks. A geologist I worked for used to bring me rare fossils and gemstones from different countries. To unwind and re-ground myself after working with grieving families – I take walks. Often, when I am reflecting on the deceased a Heart Rock will appear. It’s a rock in the shape of a heart. I don’t go looking for these, they just stand out from the other rocks or it may be a single heart rock on the trail. 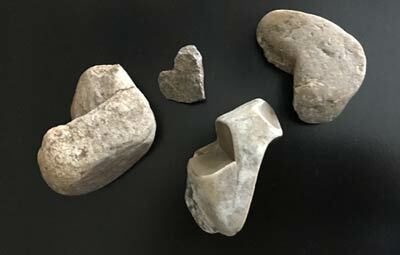 When the time comes for my own Celebration of Life, each guest will receive a Heart Rock from my collection. OR maybe they will choose a special Bird from my bird collection. Perhaps a butterfly will appear and they will know that my spirit is near. Did reading this Blog Post spark some ideas about meaningful, memorable takeaways at a Celebration of Life? In the next Blog, I will write about turning stuff and collections into memorable takeaways for the guests at a Life Celebration.